Lucky for us, the cosmos is packed with the raw materials we need and crave. Scattered across our galaxy are trillions upon trillions of space rocks, filled with the water, precious metals, and other raw materials we'll need to fuel our cosmic diaspora. Mining asteroids is not just a dream—several enterprising companies are already getting the jump on it. Still, the technological barriers are immense, and we're just beginning to come to grips with the social and political implications of a space-based civilization. Here's what we already know—and need to know—about the industry that could make it happen. Over four billion years ago, the planets and moons of our solar system began to coalesce from primordial dust. So, too, did the asteroids. While we've known about space rocks for over two centuries, the vast majority of discoveries have been made in the last two decades, thanks to bigger and better telescopes. To date, we've identified some 10,000 near-Earth asteroids, ranging in size from several meters to hundreds of kilometers across. If that number sounds impressive, rest assured it's not: By some estimates, there are upwards of a 150 million asteroids in the inner solar system alone. Astronomers continue to locate more space rocks on the daily, but we've already found plenty to be excited about. 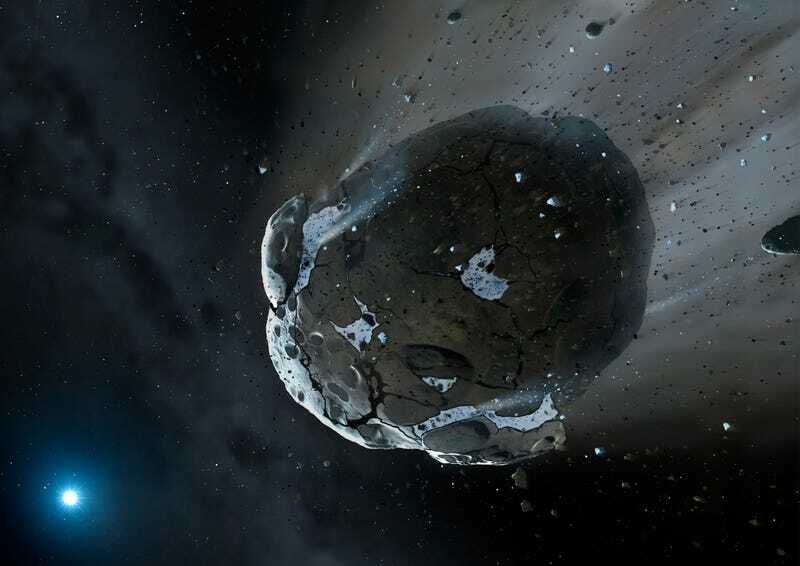 Many of the asteroids out there are loaded with water, a resource that may, in space, be more precious than gold. As Chris Lewicki, president of the asteroid mining company Planetary Resources explained when I spoke with him over the phone, some of this water could be converted to rocket fuel by splitting off the hydrogen. Wet asteroids, then, may serve as cosmic gas stations; watering holes for thirsty spacecrafts and humans alike. "When you launch a satellite up to orbit, two thirds of the weight is fuel," Lewicki said. "If we could only refuel things without sending them back to Earth, that would open up a planetary highway." Enticing as that sounds, water isn't even the most valuable commodity locked up inside asteroids. That'd be platinum, and its sister metals, which, renowned for their outstanding catalytic properties, are used in everything from computer hard drives to fuel cells to biomedical equipment. On Earth, these metals are extraordinarily rare: All of the platinum humans have ever managed to dredge from the ground, for instance, could fit inside a small Manhattan apartment. A 500-meter asteroid might contain more. There's a reason the private sector is now clamoring to get into space. The first successful asteroid miners may become richest human beings alive. But before we can start trucking platinum en masse from the stars, space miners have their work cut out designing, testing and deploying the myriad technologies needed to do so. The two companies leading the charge, Planetary Resources and Deep Space Industries, have amassed a slew of scientists, engineers, entrepreneurs and investors to make it happen. The first task on any would-be asteroid miner's list is to start pinpointing some seriously lucrative rocks. While we've got plenty of near Earths to choose from, a trip to any one of these neighboring bodies is still a major investment, so before we send out the drills, we'd like to get as much intel as we can from afar. This, it turns out, is no trivial problem. Asteroids are small, dark, and difficult to make out within Earth's obscuring atmosphere. In fact, the best way to get a good look at an asteroid is to put a scope into space. That's exactly what Planetary Resources is planning to do. Its Arkyd-100, a crowdfunded scope that weighs less than 25 pounds, will sit in low Earth orbit, peering into nearby space to analyze targeted asteroids. The next-gen version is the Arkyd-300, fondly described by company leaders as humanity's first Imperial Probe Droid. The 300-series Arkyds, equipped with propulsion systems, will travel in swarms to nearby asteroids. Once they've reached a target, the bots will analyze the rock in detail, measuring its size, shape, density and elemental composition, and beam the specs back to Earth using laser-based optical communications. The company has plans to launch two beta droids this year. If all goes well, the Arkyd-100 will launch in 2016, and the first of the Arkyd-300s will blast off in 2018. Deep Space Industries is also planning to start small, using cost-effective prospecting crafts to conduct the initial survey work. In 2017, the company hopes to launch its very first FireFlies, laptop-sized spacecraft destined for one-way asteroid recon missions. After targets are confirmed, the choicest rocks will be visited a second time with "DragonFlies", which'll bring samples back to Earth for detailed analysis. Eventually, "Harvestors" may be sent out to quite literally pull the most promising suckers back to us. Concept art for DSI's "Harvestor" craft. Credit and Copyright: Bryan Versteeg / DSI. For mining water, we'll probably go after carbonaceous chrondrites, or C-type asteroids—wet, crumbly rocks with an elemental composition similar to that of the sun. As Popular Mechanics describes, Planetary Resources envisions using its Arkyd swarms to slurp up rocky regolith and funnel the stuff into a processor. The water can then be steamed off and recollected in a separate tank. A subset of the rocks we squeeze for water—the so-called L4 chrondrites—may also be rich in platinum-group metals. How we extract these metals is likely to depend on a host of factors, including their concentration and the sort of matrix they're embedded in. "Space rocks are all different," Rick Tumlinson, Chair of Deep Space Industries, told me in an email. "There is no one-size-fits-all solution to extracting what we need from them." Even so, both companies have floated some intriguing possibilities. Planetary Resources cofounder Eric Anderson has described how we can use the sun's energy to essentially melt down asteroids and concentrate the heat-resistant platinum-group metals. Anderson goes on to explain how giant balls of the platinum might be safely returned to Earth by dropping them into an uninhabited desert somewhere. Several weeks ago, DSI announced that it's investigating the feasibility of injecting bioengineered, metal-munching microbes into space rocks. The idea here is that these mining bugs will, over the course of years, chew up an asteroid from the inside out and concentrate the metals for us. "Certain living creatures, called extremophiles, are able to survive and thrive in environments that would blow your mind, including nuclear reactors," Tulminson said. "Eventually, we believe that genetic variants of these and similar creatures might be used in space mining processes." It's an awesome idea, but, researchers have been quick to point out, one that's still very, very preliminary. (There's the minor challenge of genetically engineering a bug that's able to sustain a hearty metabolism in the harsh vacuum of space for years on end). At this point, it seems safe to say that any and all options—blasting, melting, eating, vaporizing, magnetically separating—are on the table. As we move ever closer to a space-mining future, some thorny legal questions have begun to rear their heads. To wit, under current law, it's unclear who, if anyone, can legally own an asteroid—a fact which is making early investors squirm in their seats. "Anybody who wants to go to an asteroid now and extract a resource is facing a large legal open question," space lawyer Joanne Gabrynowicz told NPR in an interview earlier this month. Space is a global commons, meaning that all nations have the right to use it and explore it. But when it comes to staking out resources in space, we've yet to reach any sort of agreement. Since the United States has obligations to regulate its private space enterprises under international law, the largely US-based asteroid mining industry has been pushing Congress to pass legislation clarifying the matter. This past September, the House Science, Space and Technology Committee held a hearing on the Asteroid Act, a five-page bill that would recognize ownership by companies of the resources they've extracted from asteroids and, prevent companies from interfering with the operations of competitors. As Slate reported this past fall, the bill was met with support from the commercial space community, but criticism from legal experts. Gabrynowicz, for one, feels that the bill fails to address wide-ranging issues, including whether granting mining rights to a US company is actually legal under international law. You know, details. For now, at least, it'd seem the asteroids are first come, first serve. We're becoming the stars of our very own space western. Asteroid settlement concept. Credit and Copyright: Bryan Versteeg / DSI. Space may be a lawless frontier right now, but this just the beginning. It's not hard to imagine asteroid mining taking off within the century, and with it, manifold new opportunities for exploration and development opening up. In the future, Deep Space Industries envisions a system of space-based manufacturing, wherein asteroid metals are fed directly into 3D printers to build new mining gear, platforms, and even outer space habitats. If, as today's space pioneers hope, we can begin to build and fuel structures off-world using asteroid-derived materials, that cuts out a very expensive middleman—Earth. At which point, manned interstellar missions and outer space settlements might be within reach. One can imagine asteroid depots scattered across the stars, resupplying our 3D-printed spaceships with hydrogen fuel, water, and replacement parts. "If the door to long-term space travel will ever be opened, it'll be opened by using the resources of space," Lewicki said. "From an exploration standpoint, this is the next big push." As dangerous as it might be, it's hard to resist the call of the frontier. If somebody offered me a pickaxe, a spacesuit, and a ticket up, I'm not sure I could refuse.